First of all, there is no one right way to readathon. Let’s just get that caveat out of the way up front. But as 24in48 reaches maturity (insert cheek pinching here) and there are more prizes to win and places to participate, several ‘thon-ers have requested a bit more guidance in advance of this summer’s event. Hopefully, this will be good for any newbies joining us for the first time or veterans who want to level up. 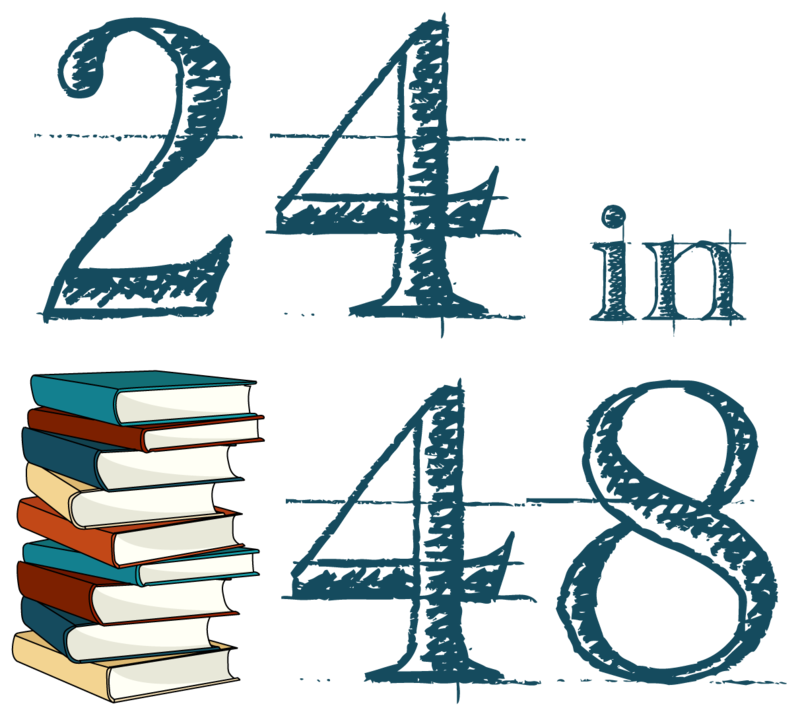 For some of the basic questions, like how to sign up, what is the 24in48 anyway, and what counts for reading time, check out the FAQ post. A lot of people (more than you’d expect) participate in the readathon without signing up because they don’t think they’ll come close to reading for 24 hours. Here’s a secret: the vast majority of people who participate don’t come close to reading that much. In fact, I don’t even really think the point of the event is to read for a full 24 hours. Sure it’s a good goal, but really the intention is to set aside some solid reading time over the course of a weekend, hang out with your bookish friends online, and maybe win some stuff. That’s it. It is literally the most low pressure readathon ever. There is no “failing” at readation. Did you read during the weekend? Congrats! You didn’t fail. So there is zero reason to not sign up. Which you can do over here. You must provide your email, your name (even if its your online persona), and at least one place where you’re participating. Please please please don’t choose a platform from the dropdown and then leave the “handle or URL” field blank. Telling me you’re going to be on Facebook without linking to your FB profile doesn’t help. Same with putting Litsy and not listing your handle (you know, that name after the @ sign). If I can’t find you online, I have no idea if you’re actually participating or if you just signed up to try to win prizes. So you won’t be able to win anything. If you need to go back and edit your entry, you should have gotten an email on the account you used to sign up that will let you click through to change your sign-up info. Pro-tip: if you listed a bunch of places where you think you’ll be participating and realize that you’ll only be using one, like Twitter, edit your entry to reflect just the one. You don’t have to be everywhere to get credit. In order to be eligible for prizes for participants that read a full 24 hours, you’ll need to keep track of your time read. Every time you start reading, hit start, then pause when you stop to take a break. It doesn’t have to be exact, but because this is on the honor system, please don’t abuse the clock (like letting it run while you nap). Pro tip: Take a screenshot (esp. if you’re using your phone) every time you stop the clock, just in case you accidentally reset it. You can use multiple screenshots to prove your reading time if need be. Every three hours a new post will publish on the blog, alternating between challenges and check-ins. The Hour 0 challenge will always be an intro survey and the Hour 48 post will always be a closing survey. Challenges: every six hours (Hours 6, 12, 18, 24, etc. ), you’ll have the opportunity to do a fun little task (usually photo- or comment-based) to be entered for a prize. Pro tip: Even though you are free to participate in the full 48 hours (midnight Friday to midnight Sunday) using your local time zone, following Eastern Time in the US (the official readathon time zone) is the best way to ensure you’re catching as many of the challenges/check-ins as possible. Posts are labeled by hour number, not by time (Hour 6 vs. 6:00am on Saturday), so if you start Hour 0 in concert with the readathon, you’ll have an easier time catching all of the challenges. If you need help figuring out what that translates to in your local time, check out this world clock conversion tool. (The downside of course is that if you’re on the opposite side of the world, your reading weekend might spill into Monday or start on Friday instead. If you decide to use local time, you won’t be penalized for having not started or starting early re: prize drawings). For Litsy: share a direct link to your post by clicking on the arrow at the bottom of the post and selecting how you want to share it (I usually email the link to myself in order to comment from my computer, but if you’re using your phone to comment on the blog, you can just copy and paste the link from the body of an email or wherever you’ve shared it to and add it to your comment). For the below post, this is the direct link: http://litsy.com/p/eGlZMm9PZGYw. Due to the number of participants, comments that only include a handle (i.e. @24in48) and directions to go look for the entry will not be eligible. You must include a direct link or the actual image in order to enter for prizes. Pro tip: tagging all of your social posts with #24in48 to cheer on your fellow readathoners is great, but make sure your accounts are public (at least for this weekend) so others can cheer you on too. You MUST be signed up on the original sign up form in order to be eligible for prizes,. You can sign up even after the readathon begins, but you can’t win anything unless you’ve signed up. And your sign up information MUST include not just the platform you’re participating on but the actual place I can go to find you, be that the URL or the handle. (If you’ve already signed up, you can edit your entry by going to the email you received and clicking through to edit.) You can’t win anything if you don’t provide me a way to find you during the readathon. If you are staying away from social for the weekend, don’t forget to check the blog periodically or at least once at the very end to see if you won something during a check-in or challenge. Prize winners will be announced throughout the weekend, so scroll through all the posts to check for your name. Pro tip: Make sure that the name you use to comment and the one you use to sign up are consistent. If I can’t match your comment to an entry on the participant list, you’ll lose out. I hope this helps as you’re prepping for the ‘thon. If you have any follow-up or additional questions, leave ’em in the comments below. 24in48 July 2017 Readathon Sign-ups are Open! I hope that everyone’s warm- (or cold, for you Aussies) weather reading is in full swing and you’ve been plowing through your summer reading lists or beach stacks. Or if you’ve had a bit of a slump because you’re doing ALL THE THINGS, I have the answer. If you’re new to 24in48, this is the basic gist: beginning at 12:01am on Saturday morning and running through 11:59pm on Sunday night, participants read for 24 hours out of that 48-hour period. You can split that up however you’d like: 20 hours on Saturday, four hours on Sunday; 12 hours each day; six four-hour sessions with four hour breaks in between, whatever you’d like. Have more questions? There’s an FAQ page for that. Also, in response to some feedback, a more detailed “how to participate” post is coming soon. Ready to join? Fill out the form below and feel free to list any and all of the places you’ll be hanging out online during the ‘thon. Check out who else is participating. If your entry doesn’t immediately pop in to the spreadsheet, give it a few minutes to populate.